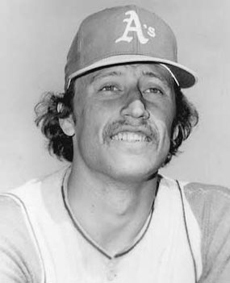 Left-hander Ken Holtzman pitched 15 seasons in Major League baseball, from 1965 to 1979, with the Chicago Cubs, Oakland Athletics, Baltimore Orioles, and New York Yankees, winning 174 games. In a career that included a partial season because of military service (he only pitched on weekends) and several limited seasons attributed to personal conflicts with management, Holtzman nonetheless pitched 215 innings or more each of nine big league seasons, throwing 2,867 innings, with a 3.49 career earned run average. In a four-year period with the Oakland As, Holtzman never won fewer than 18 games a year, winning 77 regular season games, two League Championship Series, and four World Series contests. After his 21-victories season in 1973, The Sporting News named him Left-handed Pitcher of the Year. He was on the American League All Star team in 1972 and 1973. Holtzman pitched two Major League no-hit games, both as a Chicago Cub: the first in 1969, beating the Atlanta Braves 3-0, and the second in 1971, defeating the Cincinnati Reds 1-0. His career pitching record: 174 wins-150 losses with 1,601 strikeouts. An event that some might call sporting poetry occurred during the closing days of the 1966 baseball season—Kenny Holtzman's first full Major League season and the last for Los Angeles Dodger ace Sandy Koufax. Facing each other the day following Yom Kippur at Wrigley Field, home of the Chicago Cubs, the storied Jewish left-hander limited the Cubs to only four hits. But the young Jewish southpaw threw a no-hitter against Los Angeles for seven innings, finishing with a two-hitter and a 2-1 victory. Although Koufax went on to pitch in the World Series, his head-to-head against Holtzman was his last regular season game.